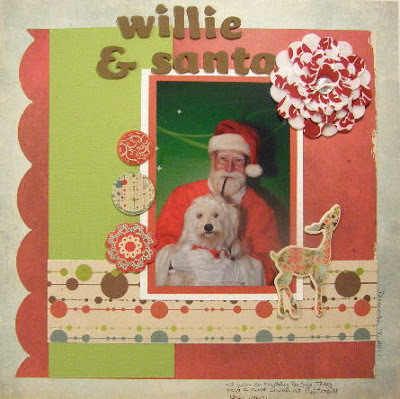 "Lasting Memories" Scrapbook Layout Challenges: Featured Layout - "Willie and Santa"... and DT CALL and GIVEAWAY Reminders!! Featured Layout - "Willie and Santa"... and DT CALL and GIVEAWAY Reminders!! Hello!!! It's Michele here today to bring you today's Featured layout from SUE!! I love how she used our sketch for her adorable photo of "Willie & Santa." The magic of Christmas definitely is shared in abundance with our four-legged friends!! Congratulations SUE!! Grab your "I was featured" badge and display proudly!! You can see all the details HERE. SUNDAY, January 1st it all ends! Thansk for visiting! Hope to see you in the next few days. Oh this is soooo super cute!! !